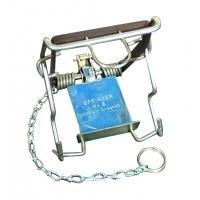 The Fenn Trap MK 6 is a larger version of the MK4 Fenn trap and is use in controlling rabbits, squirrels and mink. The same precautions with regard to non- target species should be observed. MK 6 Fenn Traps must be set in a natural or artificial tunnel which is suitable for minimising the chances of injuring or killing non-target species whilst not compromising the capture and killing of target species.